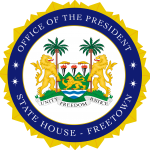 Freetown, Sierra Leone, Monday 23 July 2018 – Former President of Liberia was with President Julius Bio today to discuss the fragility report presented to Sierra Leone and Liberia by the International Growth Center (IGC). Ellen Johnson Sirleaf, the only woman to have won the $5 million Mo Ibrahim Award for achievement in African leadership, was accompanied by Jonathan Leape, Executive Director of the IGC in London and an Associate Professor at the London School of Economics (LSE). The team informed President Bio that Sierra Leone and Liberia were vulnerable to fragility and instability, adding that if proper care was not taken to consolidate a lasting peace in the Mano River Union basin, the situation might lead to serious problems in future. “Sierra Leone and Liberia share similar features about this fragility. This is the reason why the International Growth Center has drawn the attention of the two countries to quickly look into the recommendations in the report and find ways to address issues around political and economic growth in the two countries,” Leape warned. President Bio thanked the team visiting and told them of his government’s plans to work very hard and go beyond the foundation he inherited. “I have carefully looked at the report and the recommendations proffered there in and we are trying to forge beyond the foundation that we met to making serious efforts at dealing with issues raised in the report,” President Bio assured. The report guides policy to address state fragility by pointing to recent advances in research that policymakers and practitioners aren’t yet paying attention to, and to encourage new research by highlighting critical areas of knowledge missing about fragile and conflict situations.